The California Large Scale Shaded Relief Topographical Wall Map by Universal Map measures 64″ by 54″ (approximately), is laminated, making it durable, markable, and easy to clean. Map is full-color and includes historical, anecdotal, and geographical information, an elevation scale measured in meters and feet, and a distance scale measured in miles and kilometers. Identifies county boundaries, the state flag, motto, bird, flower, and tree, plus total area, population, and origin of name. 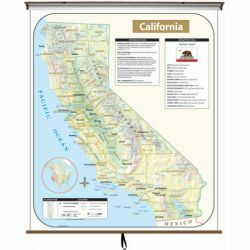 Map is mounted on a roller with backboard.